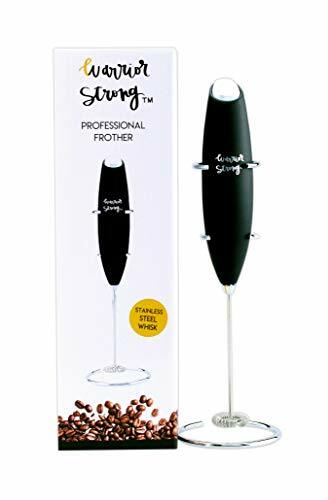 1 Warrior Strong Handheld Battery Operated Electric Foam Maker Milk and Coffee or Cappuccino Frother with a Stainless Steel Whisk, 1 Stainless Steel Stand. Requires 2 AA Batteries (not included) Great to Mix Coffee, Tea, Cleanses, Hot Chocolate or any Collagen or Bone Broth Protein Type Powders into your Favorite Liquids. Easy to Clean. Powerful Quiet Motor. A Portion of the Proceeds will be donated to Childhood Cancer Research to the St Baldricks Foundation.